Apple products have never been a significant part of my computing life. There were times over the years when I had to use an Apple computer, but as a gamer and because Windows computers are so prolific at educational institutions and businesses, I never had much experience with Apple. The iPod craze failed to impress me because of Apple’s attitude towards DRM. In general, I dislike Apple’s more closed approach to its operating systems and hardware. Macs have never had has many options with regard to gaming compared to Windows computers. I don’t hate Apple; their products just don’t appeal to me. Further, I find the cult fever and fanaticism around the company and their wares to be very off-putting to the point where I view all their products with a healthy degree of scepticism. My point is: I am a person for whom the iPad was of very little to no interest. It’s an incredibly expensive gadget, and I saw it as something which I did not need or had little use for—after all, I have so many other gadgets that can do everything an iPad can do. Last year, my company, ArenaNet, gave all of its employees iPads as an end-of-year holiday gift—a most generous gift, to be sure. As with the time the company gave each employee a Kindle (Generation 1) as a holiday present, I was torn between selling it (because I didn’t really need it) and keeping it. Because some of the best gifts are cool things you wouldn’t buy for yourself, like the Kindle, I decided to keep the iPad—in a way. While my colleagues took their shiny new iPads to work meetings for note-taking or checking emails, I decided to trade my iPad in for Apple store credit, wait until the iPad 2 was released, and spend the Apple Store credit on the successor to the iPad. At the beginning of the year, the iPad 2 was just a credible rumour. Fast forward four months. I’ve had my iPad 2 for a couple weeks, and I’m going to share my impressions of this device. Going through my RSS feeds is often tedious for me because it ties me to my computer. It’s something I often dread because I follow so many blogs. Using my iPad 2, I can sit on the sofa and read my RSS feeds on a device that is more convenient, more comfortable and easier to read (in terms of layout and such), than a netbook or laptop. I’m also following current events much better and more closely on news sites like BBC World News and The Guardian than I ever have been in the past four years relying exclusively on my PC or laptop. My iPad is like a portable electronic magazine for all the news I would like to follow, but for which using a PC interface or a laptop is not ideal or comfortable. Keeping up with news to a degree which I have not done for quite some time is a significant positive aspect of having this iPad 2. I can access my Kindle library and buy books for my Kindle and read them on my iPad 2. I probably don’t need my Kindle anymore because now I can read my Kindle books on a device that multi-tasks. The only downside is that reading on iPad in the sun is not ideal, and I feel that the Kindle e-ink screen is better for long reading sessions than the iPad. Kindle is better suited to that. But I can read on the iPad in total darkness without any external lighting, so there are trade-offs. Comics – A comic book reading app by Comixology on which you can read free comic books and purchase digital comic books from publishers like DC Comics and Marvel Comics. DC Comics, Marvel Comics, and Dark Horse Comics each have their own apps, but I have decided to explore the Comics app more thoroughly before looking at the comic book apps from publishers. Using the iPad 2 for Netflix is awesome because it neither ties me to my television nor my computer. I can play videos from Netflix in bed. This is particularly handy because the PlayStation Network is down, and playing Netflix on my PS3 was my primary method of watching my Netflix content. There are some great games for this device, like Infinity Blade and Corpse Craft. I am playing Words with Friends with my colleagues, and this is a plus in terms of that whole social glue thing. It gives us another talking point during the day. I could play Words with Friends on my computer on Facebook or on my Android phone, but it’s so much more convenient on my iPad 2, and my Android phone has been slow in terms of performance lately, to the point where I don’t want to play games on it anymore. I have all my email accounts, even my work account, at my finger tips on the iPad 2. On my desktop or laptop, I would have to manually go to every single account—I have six accounts on which I check mail (4 Gmail, 1 Yahoo!, 1 Exchange (work))—to check my mails. The number of Gmail accounts I use complicates things because I have to log out and login to those accounts in the browser, and two of those accounts use Google Apps, so the inconvenience is multiplied. Whilst my Android phone can check all of my email accounts, I use three different apps for it because each of those apps meet particular needs for the email accounts I choose to associate with them. Typing emails on a mobile phone touch screen doesn’t lend itself to long emails, so I tend to avoid emailing on my phone. My iPad 2 has a single app that unifies all of my email accounts into one interface, and has a larger screen and keyboard for writing messages. This has been a massive boon to me in terms of convenience. My work calendar and personal Google Calendar are also integrated into one interface so I can access my schedule at-a-glance. It’s not as robust as the Calendar app on my Android phone, which lets me add calendars in iCal (such as my calendar for air travel or my Meetup groups) as well as integrates my work calendar, but the iPad one works just fine. I’m not relying on my iPad 2 to the degree that I need specalised word processing, presentation, or spreadsheet applications, but they do exist for a price, should I need them. Dragon Dictation – If I ever need a speech-t0-text application, I have one. 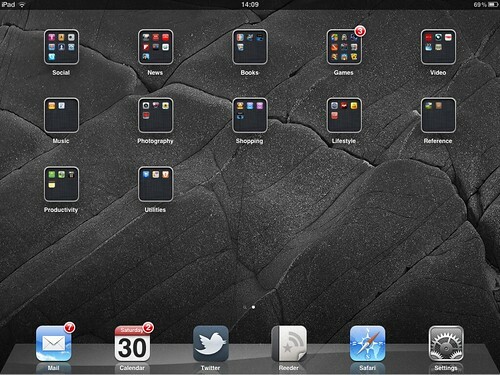 Dropbox – Essential online storage service; I took a screen shot of my iPad 2 home screen, uploaded the image from my iPad photo album to my Dropbox, sent that to my Flickr, and used it as the leading image of this blog post. MyKeePass – KeePass password manager app. This isn’t a native iPad app, and it’s difficult to get working with Dropbox, but it’s minimally usable. Notes – Comes with the iPad; I use this for throwaway notes that I don’t need for long. Safari – Comes with the iPad; This web browser works for me and I feel no need to purchase or download a different one. Naturally, I use my iPad 2 for keeping up with my social networks. Twitter’s official iPad app is surprisingly user-friendly and intuitive. For some reason, Facebook doesn’t have an official app, but there are tons on the App Store to fill that need. I thought about installing the official WordPress app or an app that hooks into my blogs, but given that the on-screen keyboard is uncomfortable to use for long periods of time and the low user ratings for the WordPress app, I decided that blogging probably isn’t a use at which the iPad excels. I’ve decided not to install the Gowalla and Foursquare apps for iPad for now. I already use these on my mobile, and my mobile is more likely to be with me when I’m out and about than my iPad. I don’t browse Gowalla or Foursquare much unless I’m bored waiting for something, and in those cases, I’m usually on the go without my iPad. Flixster – I don’t have any friends on this social network, but I like keeping my movie ratings somewhere. I think I’ve rated over 900 films on here. I have other apps which are just icing on the cake. For example, I’m trying out this sound machine app that plays different sound effects to a timer. It plays me ocean sounds at night before I go to bed, automatically turns off, and then wakes me up to ocean sounds in the morning. This is relevant because I have been having a lot of trouble sleeping and sleeping through the night lately, so I’m trying to see whether having relaxing sounds in the background may help. I also have this neat weather app that basically acts like pretty, animated screen saver whilst displaying current weather information. This thing is awesome. I love it. I never expected to be this pleased with an Apple device. I’m seriously impressed with my iPad 2 because I’m finding a loads of uses and experiencing conveniences that I never realised I missed because I didn’t have them before I got an iPad. As I mentioned above, there are things which the iPad won’t be able to do. It’s just not comfortable to type on for long periods of time, however you can purchase a wireless Bluetooth keyboard for the iPad if you really must use an iPad for typing long blog posts or emails. Whilst the iPad has some great games, it doesn’t have all the same games that are available on consoles or computers. The main benefit I derive from the iPad is that of convenience, and this is a big deal for me. I’m really happy with my iPad 2, and I’m glad that I decided to keep it. Whilst I won’t say that I’m now an Apple cultist, I am more favourably disposed to their products. I would never have bought this for myself, and I still think this gadget is too expensive and definitely not something that most people can afford. However, I enjoy what I have and I appreciate the generosity of a company that gave me such a cool gift. did you ever consider getting a android tablet like the motorola xoom? No. I was never in the market for a tablet, iPad or otherwise, and if hadn’t been a present, I’d never have purchased an iPad 2 in the first place. I’m not interested in having another tablet as I’ve already got the iPad 2. The iPad 2 works just fine, so I don’t think there is a need to shop for another one or look for something better on the horizon. I wonder what an Apple cultist is. Maybe I’m one, maybe I’m a fanboi. Who cares what people label me as. I’m waiting for an iPad 2 and I’ve been using an iPad 1 since they came out. And I waited YEARS for the iPad 1, ever since the Newton. For its time it was amazing. Handwriting recognition, email, games, to do lists, I loved it. Of course it was only in Black and White. Fast, long battery life. It was years ahead of its time. The iPad is its successor. It does everything the Newton did and MUCH, MUCH more. I don’t know how well it integrates with Windows, but it syncs so well and almost instantly with my iMac, that I use it as an extension of the computer. With the free Remote app, I can wirelessly direct music from the iMac to any and all the rooms in the apartment and any change I make on iCal is instantly echoed on the other Macs in the house and vice versa. The small screen size means that page layout and large scale graphics are out of the question, but for long writing jobs, the iPad works fine with ANY keyboard. Get a USB adaptor and you can use any USB keyboard. The reason I like the iPad and the Macs I use, is that I don’t have to worry about them, I don’t need to keep pampering them, defragging them, running virus checks or worry about everything slowing to a crawl after several months of use. It works as advertised and I can concentrate on what I am doing with the computer rather than getting distracted or having to Google to find the answer to a complicated problem. I’m not interested in getting into Macs versus Windows debates. I find them tiresome. :-) I’m glad that you find Macs useful for your needs and I’m happy that you’ve found computing solutions that work for you and your lifestyle, but not everyone has the same needs. As a gamer, Windows computers have served my needs pretty well. It’s not so bad inside the walled garden after all. Watch out. Your newfound enthusiasm may cause the unenlightened to label you as a Koolaide-drinking cultist. They will turn on you. Let’s just let it be our little secret. Another app you might want to consider adding is “AppShopper”. You can put in which apps you are considering and it will alert you when the app gets updated or the price changes. I’ve been able to get prices that are between 2 and 5$ lower than the original one. It also shows you the updating/pricing history of the app, so you can decide if it’s a good idea to wait or not. Thank you for the recommendation. Sounds like a very useful app. I’ll check it out! Thanks Brinstar for the info on the apps. I too would love to use my iPad more with a keyboard since I type much faster that way. I guess the ability to use the iPad anywhere and anytime is great, but I still also enjoy my PC for the big jobs like writing extensively and larger projects. Trying to figure out what to take on the road is always a big decision, so maybe I can find a smaller keyboard since they seem to work with an adapter.